Umami Mart Japan Beer Fest! Kabocha Pie and Buckwheat Breton Cookies! Peach Cake on June 24th! 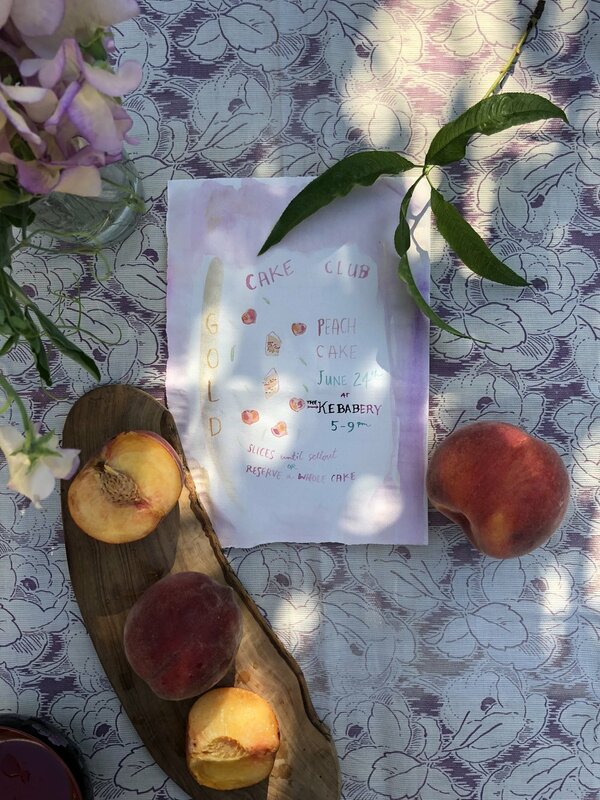 Peaches are slowly rolling in and summer is beginning to display its fantastic bounty so put your sunglasses on and settle in with some peach cake while it all lasts! I'll be at the Kebabery on June 24th with slices from 5-9 for dessert with your kebabs. If you need more than just a slice, email me to reserve a whole cake ($30/6"layer cake) and I'll have a box ready for you to pick-up. Hope to see you then! 420 Flea/Artisan Market at Oakland Yard! Cake and cookies at the Oakland Yard Flea Market! Transitions and the in-between places can be unsettling, but eventually you find yourself in what is no doubt spring with snap peas and rhubarb. Rhubarb! Sweet and sour with it's dramatic vibrant color, rhubarb marches right in hinting of more good things to follow. This month's cake will be ready for pick-up on April 29th where I'll be hanging out at Oakland Yard Wine Shop+Junction on 40th Street in Oakland with cake and they'll be pouring wine flights. Come join us! Gold Bakery Pear+Ginger Cake Pop-Up! Summer is here! Peach Cake is here! Some of you devoted subscribers may remember this cake from last year; it was definitely one of the most popular cakes. If you haven't had it, it's sort of like a pumpkin cake for carrot cake lovers. Roasted kabocha and warm spices are folded into a soft cake with a crunchy, spicy ginger streusel layer and topped with a creamy whipped cream cheese frosting. A dusting of pepita and orange candy brittle encircles the edges to ensure everyone gets a little beauty+crunch in their slice. It's a true fall cake and perfect to share for your festivities. I'll have cakes ready for pick-up at my Bartavelle pop-up with Steep Tea Co. on November 13th from 1-3 pm. Steep will have their delicious chai and I'll have kabocha cake slices available (until sold out) if you can't subscribe to a whole cake this month. Cakes are 6" and $30. I can take cash, check, paypal, or card upon pick-up. Email me to reserve your cake. But wait, what about Thanksgiving? I know you really need a pie not cake for your holiday so stay tuned, I might just do pie for pickup on November 23rd. Yes! October Cake Pop-Up with Steep tea Co! Gold Bakery+Eureka Coffee this month! Sweet+savory treats on the Eureka Coffee truck the first few weeks of September! So excited to pop-up on the Eureka Coffee truck starting this Thursday September 1, and for the next few Tuesdays+Thursdays you can catch my treats with the best coffee in town! Mark your calendars: 9/1, 9/6, 9/8, +9/13 for the Eureka Gold Pop Up. I'll have madeleines, sweet +savory tarts, cookies, cakes, and Jessica will of course have delicious coffee served from her beautiful truck. July peach cake is here!